Delhi's two best-known B-schools, FMS and IIFT, have dropped in our rankings. But that's not because they have gotten any worse; it's just that their competitors have become better. Things have never been better for MBA aspirants. With the economy on a roll and corporate India on an expansion spree, the demand for managers has been growing. Placement season this year saw salaries soar as demand far outstripped supply. While the IIMs were the most sought after, second-rung colleges, too, were in demand. Take the case of the two Delhi-based business schools that have actually slipped in our rankings this year-the Faculty of Management Studies (FMS) and the Indian Institute of Foreign Trade (IIFT). While FMS has dropped four places to 12 in our overall rankings, IIFT has fallen to the 16th position (from 10 in the previous year). Both the colleges, though, had a successful placement season this year. FMS saw average salaries shoot up by 35 per cent this year to over Rs 12 lakh per annum. As many as 105 companies queued up, but only 36 managed to recruit. And a virtual who's who was there, including IBM, Cognizant Technologies, Standard Chartered Bank, ICICI Bank and HSBC. IIFT placements, too, had an impressive turnout of blue-chip recruiters. Average salaries were up over 23 per cent to Rs 8.5 lakh. The recruiters included private banks like Citibank and ICICI Bank to FMCG giants HUL and Dabur to tech majors like Infosys and HCL. And yet both these colleges have slid in our rankings. Clearly, they are facing increased competition from the other B-schools that have not only caught up with them, but also outscored them on the parameters on which the colleges were ranked. These include infrastructure, reputation, faculty and quality of placement. Says Shiv Agrawal, CEO, ABC Consultants: "The gap between the top B-schools, including the IIMs, has narrowed. So if some schools have slipped in the rankings, it may not be because the performance of these schools has not been up to mark. It's just that other schools might have done better than them in the last one year." Both B-schools are already moving to reclaim their positions. FMS, for instance, has been busy for some time now in improving the infrastructure at its disposal. A department of the University of Delhi, there has always been a question mark over its ability to generate adequate funds to provide quality basic amenities like a well-equipped library and excellent it infrastructure to its students. It's an issue that the University of Delhi is now trying hard to address. Recently, it spent about Rs 8 crore in stocking the library and putting an online journals system in place. FMS now claims to have access to over 33,000 journals. Efforts are also underway to build on the technology resources of the institute. The North Campus of FMS is now fully Wi-Fi enabled-in the last year the institute has added state-of-the-art hp computers for its students. And that's not all. A University Grants Commission (UGC) grant of Rs 36 crore has been approved for FMS to further tone up its infrastructure. Also in the pipeline are plans to build a bigger integrated campus for FMS in Delhi University's South Campus over the next two years. IIFT is also moving to get its basic infrastructure in place. A deemed University approved by the UGC, the institute gets aid from the Ministry of Commerce. In fiscal 2007-08, it has been given a grant of Rs 1 crore to improve its it infrastructure, Rs 70 lakh for stocking its library and Rs 40 lakh for its other training facilities. Just the same, IIFT claims that the facilities provided by the institute to its students is second to none. "What we give the students is just fine. We are better than the IIMs in infrastructure," says Satinder Bhatia, Chairperson, IIFT. 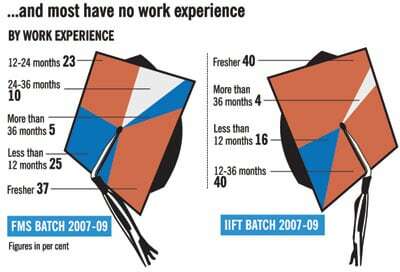 B-school watchers agree that in a few years, most of the frontline institutes would be on par. Says Ronesh Puri, MD, Executive Access, an executive search firm: "Quality of infrastructure has improved in most of the institutes recently. In two-to-three years, there will be little to choose between them." There are other areas where the two B-schools are trying to improve. IIFT, for instance, is looking to become a research-driven institute. The institute, which was established in 1963, initially functioned as a think tank for the government on policy matters related to foreign trade. That still continues to be its core competence, but it's now planning to broadbase its research initiatives and focus more on industry-specific research. Says Bhatia: "We have to do more research to give us the edge over other institutes." Adds K.T. Chacko, Director, IIFT: "The research done, in turn, will be taken to the classrooms and will enrich the course content." FMS, on the other hand, has recruited about eight faculty members last year to further improve its faculty-student ratio (which is now less than 1:10). It's also looking to revamp its course curriculum and build the institute as a Centre for Academic Learning. The thrust, the school says, is to build leaders for the future with focus on corporate and social responsibility. But even as FMS and IIFT grapple with problems in the short to medium term, most experts agree that both these institutes are centres of learning that have a lot to offer to budding MBAs and India Inc. They have a rigorous process of selection, which ensures that only the very best make it to these institutes. 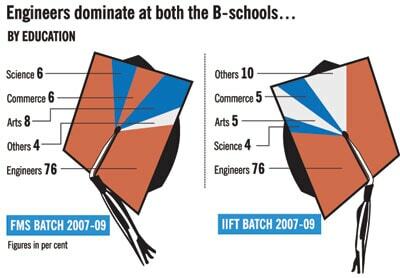 IIFT, for example, received 40,000 applications for 180 seats (a ratio of over 220 candidates per seat). At FMS, the numbers were even more staggering-this year, over 50,000 students applied for 130 seats (that's 380 applicants for one seat). Then these institutes ensure regular co-ordination between students and the industry through seminars, conclaves and guest lectures. This not only helps the students in getting exposure, but also helps them in getting placement offers. Says Arka Bhattacharya, an IIFT student of the 2006-08 batch: "We have a packed student activity calendar. We get regular opportunity to network with experts and leaders from corporate India." What makes an MBA from these two schools even more of a bargain is their reasonable course fee. FMS takes pride in the fact that it is the least expensive management school in the world. It charges a measly Rs 20,000 for its two-year MBA programme. IIFT is more expensive at Rs 1.75 lakh per annum, but is among the few institutes in the country to offer a two-year course in International Business. Points out Chacko: "International business education is our USP. With India's integration into the global economy, it's a handicap if business executives don't understand international business variables." Adds Agrawal: "Institute rankings have become dynamic with all the institutes striving to be the best. But it still does not take away from the fact that both FMS and IIFT are on a good wicket." Indeed, it's just that they'll have to work a bit harder to go up the rankings.